After I started folding my fitted sheets in the manner I detailed earlier today, I realized that it was very similar to how I fold my large bath towels. The way I fold towels is extremely convenient and efficient because the towels are folded in such a way that I don’t have to refold them to put them on the hanging bar. I just pull them out of storage and hang them up. I fold smaller towels in the same manner but skip step 4 in the process. Why didn’t I think of that? It make so much sense to store things in the “ready” state. Now I am thinking about what else I can do that with. For several years I stopped at a mid-commute gym for my workout. As I put away clean laundry, I used to roll my gym clothes in sets. I kept several pairs of clean socks in the duffel and all I had to do was toss in the roll that contained the exercise pants, sports bra and tank top. Thanks for including photos – really helps! If I fold in thirds in both directions, my bath towels fit perfectly into my cupboard. I think that any folding method that helps them stack neatly where you store them is the best method. My mother taught me to fold towels this way nearly forty years ago – nice to see that that good ideas stand up to the test of time. It always amazes me that people don’t already know how to fold a sheet or towel. I have always taken it for granted that this is the most efficient way of folding. My mother taught me this some 55 years ago…as soon as I could do it. She was also an original “unclutterer.” She wouldn’t have a toaster because the stove had a broiler…you just had to turn the toast over. We used sterling silverware because that’s what we had. Why buy stainless when we already had knives, forks and spoons? We ate fish, lobster, abalone, and venison because my father was an outdoors man by by career and choice. I was totally deprived of t.v. dinners and store bought bread for many years. My mother made biscuits, corn bread and griddle cakes. This wasn’t on a farm, it was in modern so. Calif. I felt totally deprived. For years I rebelled, so now I am having to declutter all that stuff I collected. Luckily I’m not a hoarder, but I have a lot to get rid of. Thanks for freecycle. Heh! I work at a Sheraton hotel as a bellman and the other day I got a housekeeper to show me how they fold their towels. They do it exactly the same way! 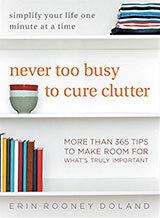 Been doing this for years – I’m glad that I’m naturally efficient! Yes, I too have been folding towels this way for years. Second, if you want to remove a towel that’s not at the top of the stack (maybe because the top towel isn’t the color you want), then first slide one hand into the stack above the towel that you want to remove. Gently lift your hand up an inch or so. Then use your other hand to remove the towel you want. 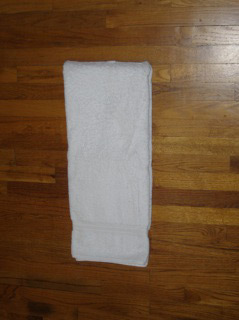 This method allows you to remove that towel without disrupting the other towels in the stack. or… if you have an odd shaped space and you still want to fold your towels in thirds but you have to utilize a funky (in our case narrow) cupboard… you can fold one long side, then the other long side, as shown in the photo… then ROLL the towel up rather than fold it again. 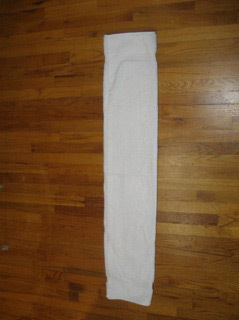 you can still grab one towel and unroll it to put it on the bar, but you can stack them in a more narrow space. We roll our towels- I had to prove to my husband that it was the most efficient way to store them in our space, though. So, why not fold width-wise first? Then you could do it in your lap and you wouldn’t need a large surface for folding. You mean folding one side, then turning the towel and folding the other side, and then cursing because bath towels are unfoldable is not how everyone is doing it? I learned to fold towels when i worked in a linens and draperies department in high school. It is a different method of folding, designed to make the towels look attractive and streamlined on shelving. The goal is to have the decorative stripe facing out of the towel, and when you stack the towels, all the design edges flow into the next one down. It may take an extra 2 seconds of refolding to get it in a different position when i put it on the towel bar, but my linen closet looks like it should be photographed and in a magazine. We’ve been doing that for years. We always liked the look in the linen closet and on the towel bar. Thanks for the reminder and the photos. I worked at an expensive Bed and Breakfast throughout college and we folded our towels the same way (as well as our fitted sheets). I’ve been folding mine that way ever since, and not only do they look great, but it really is a lot easier to put them on the rack and shuffle them around when needed. Ahhhh, okay. I honestly couldn’t figure out what you were doing with the fitted sheet the other day. I couldn’t make it out from the pictures. The towel makes it easier to visualize. “Hey, I’m a guy.” I certainly would never have risked the unmanly situation of asking my mom how to fold a sheet or towel when I was growing up. Things have changed in this day and age, but back then I would have felt silly even possessing such knowledge. I’ve been folding my towels in 3rds for 35 years. It keeps them neat in the closet. I learned from a small hotel I worked at when i was in high school. I do not hang my towel folded on the bar. We hang our bath towels mostly on hooks (an over-the-door hook for me on the closet just outside the bathroom, one in the bathroom for hubby – there wasn’t room for more than one hook where his is), so how they’re folded only matters for storage in the linen closet. I’ve never understood the obsession with folding towels in thirds. My mom always just folded ours in half, then in half the long way, then folded up like the last two pictures. This worked great, plus when you put a “folded in half” towel on the rack, you can actually USE it! 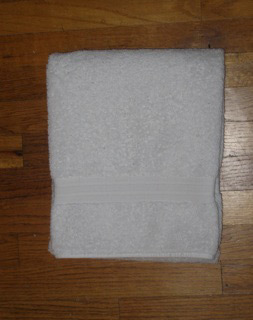 One other thing – my MIL is totally obsessive about folding her towels like shown above, yet they only have hooks for bath towels, and when she uses smaller towels (to dry her face after washing it at night, for example), she just stuffs it back on the bar, without folding it and hanging it neatly. She does the same thing with washclothes, then complains she has to use a clean one every time she washes her face (morning and night). If you hang things up neatly, they’ll dry and can be reused a couple of times before washing! So why the obsession with neatly folding the towel in thirds for the closet? EngineerMom: putting on my economist’s hat, my assessement is that the reason that thirds is considered nice is that it’s harder. 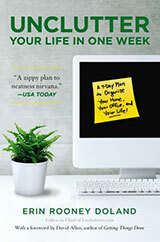 Think of it as a bit of conspicuous consumption – in this case, consumption of time. Towels. Ah, an interesting subject. I am clueless about towels, or so I’m told. I still argue with a certain friend about whether a washcloth is a towel or not. (It is, right? Back me up here.) For my use, I have two sets that are exactly the same. They have to be folded thirds longway, then quarters shortway in order to fit into the closet space. This has nothing to do with hanging them up – I have hooks in my bathroom. My kitchen towels are folded as they’re hung, thirds then halves. This has the dual advantage of getting them to fit their space and easy to grab and hang. I love having guests so I have 3-4 sets of guest towels, each set a different color so the guests don’t get their towels mixed up. For those to fit in their space, it’s quarters longway then thirds. Sounds a bit psycho, doesn’t it? But as a result they’re easy to get to and in good shape. The sets I have, even my daily use towels, have lasted a deceade and going strong. They look so good! was it really difficult to do? 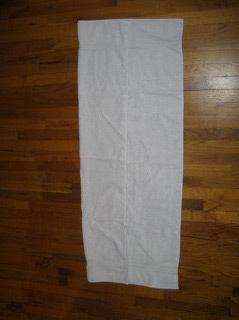 I have actually just bought them some new bamboo bath towels, made from bamboo, so soft and lovely. I’m gonna get myself a dressing gown too. you must be able to fit so many towels in small spaces! genius!